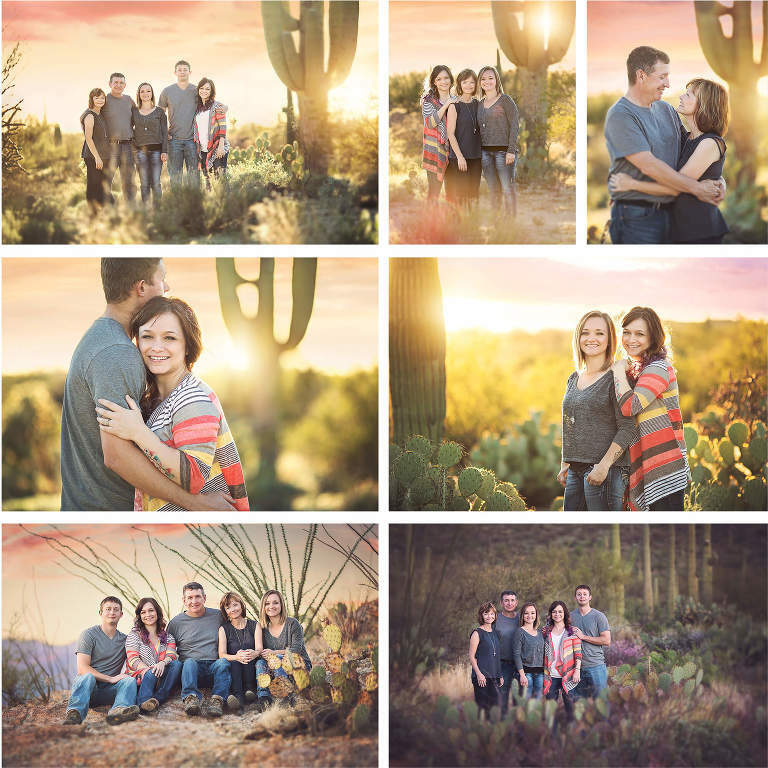 The Cox family selected Sabino Canyon because of it's picturesque desert landscape. Their time in Tucson was short so they wanted a unique landscape they couldn't find anywhere else. 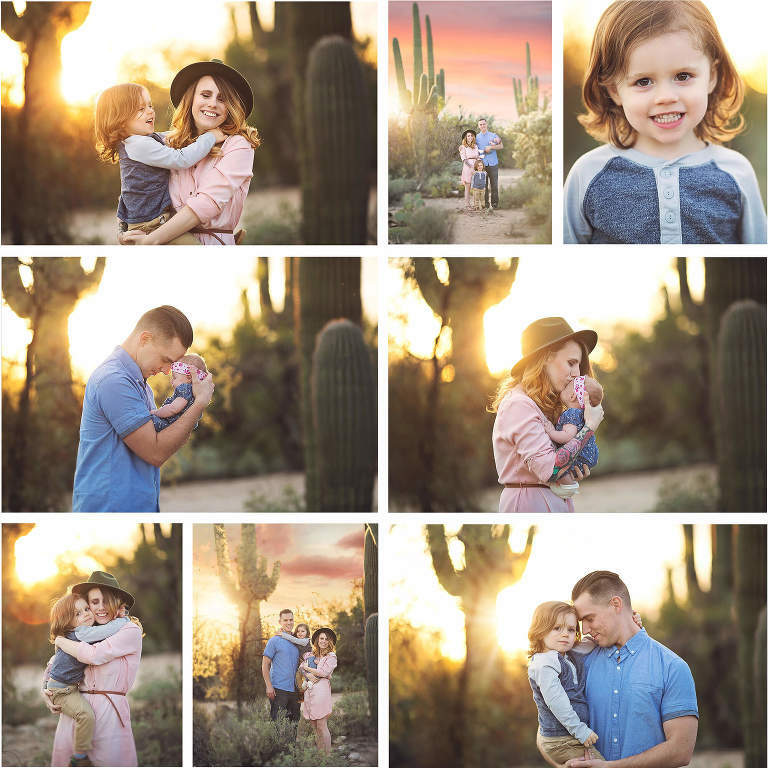 Between the saguaros, the mountains and the Tucson sunsets, their family session was just what they had hoped for. Located in the Santa Catalina mountains in Northeast Tucson, Sabino Canyon has a variety of location options. The desert floor is easy walking distance from the parking lot. This is where you will find your sunsets and saguaros, however a bus ride into Sabino Canyon grants access to running water and mountain-like vegetation. Park entrance fees apply. New to Tucson the Jeffery family wanted a photo location different than previous family photo sessions in their former home state. Saguaro National Park was their choice. Saguaro National Park features an endless expanse of ancient saguaros set around an 8-mile loop. If you want saguaros, this is the place. Saguaro National Park is actually two parks, one on the East side of town and one on the West. This session was taken at Saguaro National Park East. 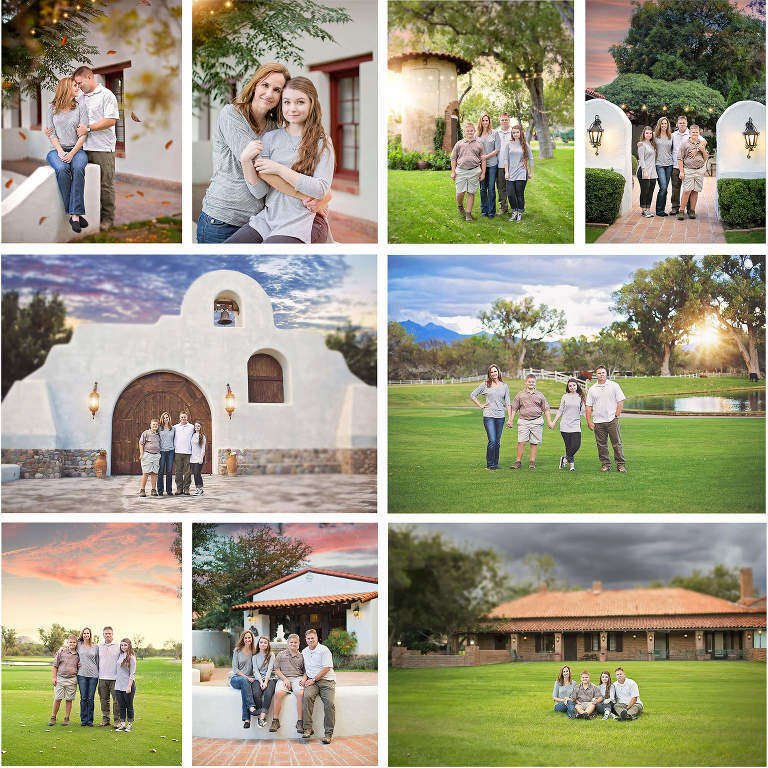 The Harkins family chose to have their photo session at the Tubac Golf Resort. Situated in Green Valley, AZ, about an hour from Tucson, the golf resort boasts lush grassy courses, ponds, buildings with local style, fountains and a little romance. Tubac is beautiful during the summer months because of the monsoons and cooler temperatures. It provides an escape from the city in a relaxed, yet upscale atmosphere. This is one of my favorite locations for couples or senior portraits, but is versatile and fun for families as well. The University of Arizona is a fun and incredibly diverse campus. Beautiful architectural structures, abundant flowers and trees at all corners. 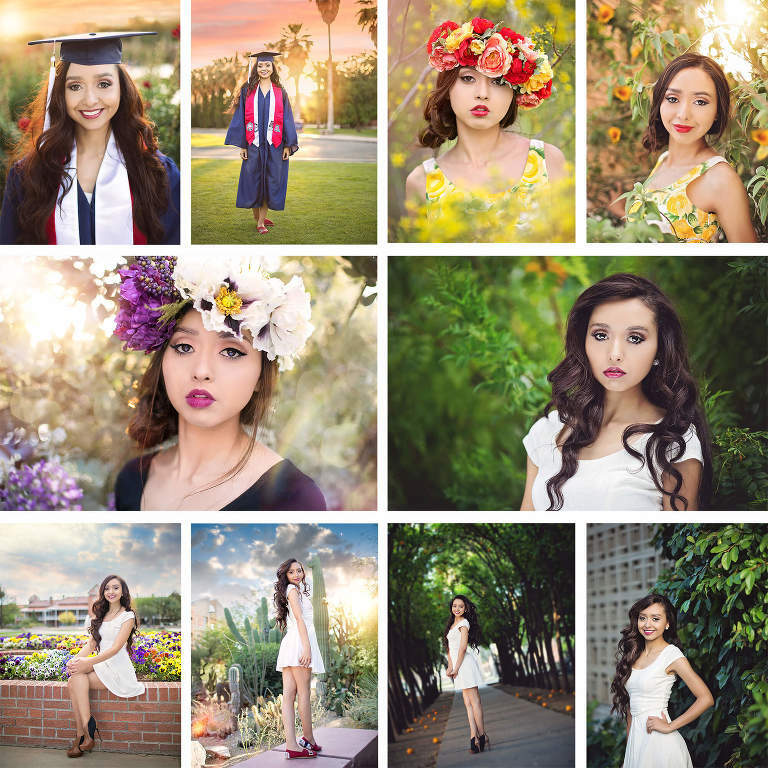 The beautiful and talented Miss Charmayme graduated from the University of Arizona and selected her school for her senior portraits. The University of Arizona campus is best suited for senior portrait sessions, women, business photos and couples, however there are several places that would be gorgeous for children and babies. Family sessions would be possible here, but a little more limited. The Keeme family chose a local golf course for their family holiday session. It was a beautiful location with soft warm light and plenty of green. There was plenty of room for their children to run around and play keeping the session fun and fresh for them. If you are a member of a local golf club, inquire about having your session there. Golf courses are the perfect location for any type of photoshoot, from small children to large families. Not all courses may allow it. Some may require a fee, others may allow your session with restrictions. There are a number of local parks perfect for photo sessions as well. The photos on the right were taken in the rose garden at Reid Park in central Tucson. Reid park is fairly versatile for different types of sessions, however it can get busy during the weekend. The images on the left were taken at private park on the East side of Tucson. There are parks all over Tucson, both private and public, that boast wonderful perks like ponds, fountains, grass, trees, flower gardens and more. When choosing a location for your photo session, do a little exploring around Tucson so you can pick a location that's is perfect for you.